The Philippine Blog Awards last Sunday was quite an occasion, with so many bloggers in one place (in One Esplanade, actually). PinoyMountaineer was a finalist in the Hobby/Recreation category, and surprisingly, the article on Limatik won the Best Single Post award! Other articles in the site were finalists also like Mt. Guiting-Guiting and Mt. Dulang-Dulang, but it had to be this climb health article, with such a boring, straight-from-a-textbook title “Limatik (Blood Leeches): An Overview” that was deemed by the judges as the best. I’m glad that my “leeches in the eyes” experience last January wasn’t in vain! This year is just the second year that the Awards were held. 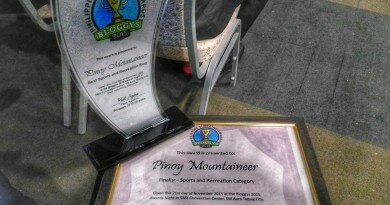 “Recognizing the finest blogs in the Philippines” was the theme and 36 awards were given in total. Congratulations to all the bloggers who won, particularly my classmate Benj Espina who bagged the Best Personal Blog award. You may visit the list of winners at this link. ← Pico de Loro area to be made into a landfill? 6 Comments on "Blogging matters #1: The Philippine Blog Awards 2008"
panalo namn lhat ng entry m d2 s pinoymountaineer eh!!! kung alam m lan..ang daming nkkappreciate ng lhat ng effort m to put up this site and to keep it up and running!!!! More power to this site and to all outdoor lovers in the PI. Now Im beginning to like the limatiks! Hahaha! Congratulations not only for winning this particular blog but for your entire SPOT as well!